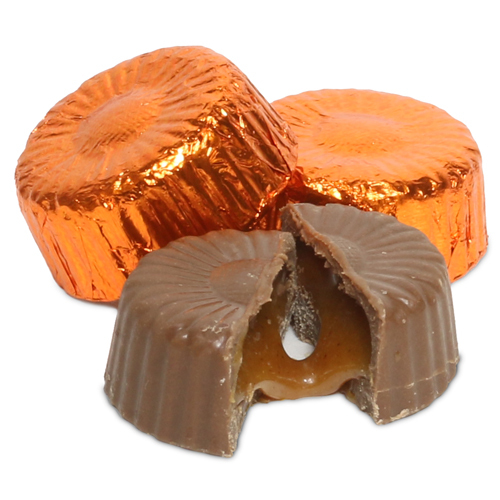 Luscious vegan "milk" chocolateis filled with creamy pumpkin spice caramel - the perfect portable pumpin bite! 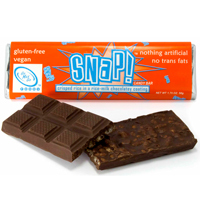 Ingredients: Vegan "milk" chocolate (organic rice milk, organic evaporated cane juice, organic cocoa butter, organic cocoa paste, organic almonds, organic vanilla), organic evaporated cane juice, organic rice syrup, organic coconut oil, organic almonds, organic cashews, organic sunflower oil, sea salt, organic vanilla, organic cinnamon, organic ginger, organic cloves, organic nutmeg, organic cardamom. Vegetarian info: Label states vegan. Approximately 17 bites in 1/2 lb. Great for the autumn season! Love the pumpkin flavor of these! 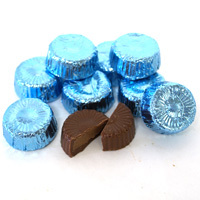 They are a great item to compliment other Halloween candy as very few are pumpkin flavored. Tasty with a nice texture. Perfect for the fall! 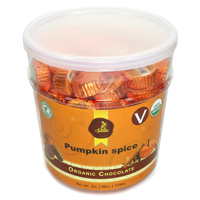 Absolutely delicious, tastes better than regular milk chocolate, center perfect consistency and amount of pumpkin to caramel and the outside is divine!!! My kids go crazy for these bite size treats! The inside filling tastes just like a caramel pumpkin pie but the "milk" chocolate is way too sweet to balance the caramel well. 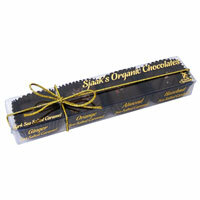 If the outside was a dark chocolate (with sea salts on top) this would be divine. As is, it tastes like a pumpkin pie with a super sweet milk chocolate crust. Although that might sound good, the combo just doesn't work.